Wow, was one of my New Year’s resolutions really to tend to my blog more? Well, I guess that one was over before it started! So my first post of the year is for this month’s Kulinarya Cooking Club challenge: your favorite birthday food. leche flan is indeed an icon during birthday parties… that is one Pinoy treat that I really LOVE! love the inclusion of orange zest in your recipe… hmm i could taste it already! Your Leche Flan looks delicious. I usually steam and use lime zest but I haven’t tried baking and using orange zest; how interesting. I can’t wait to try the orange zest on mine. Thanks for posting. The leche flan looks great and I can tell it tastes heavenly! I love love love leche flan and I could easily finish off a llanera in one sitting! I love Leche Flan! But I never had an Orange scented one so this is something new. Great recipe. I’ll try it next time I make Leche Flan. 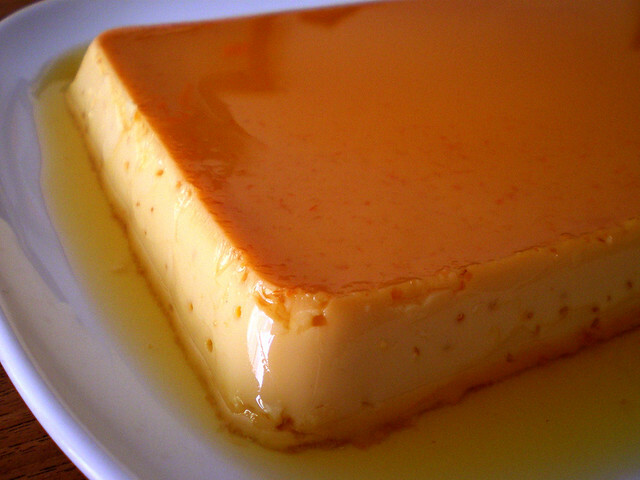 I love this topped on Halo-halo…..
Leche flan is the truth! Have you ever been to Galerias on Broadway? They serve an orange scented flan. I appreciate your super-creamy recipe too… my lola used to make an eggy eggy one, and the first time I tried super creamy I was hooked. Don’t tell lola! The flan looks so silky and creamy. Yum! I agree with Cusinera, this would be great on halo-halo. Ohhh leche flan. It has been a while since I had leche flan. There’s more than one who posted leche flan for this month’s KCC – it shows how a lot of people want to have it on their special days. Oh, you’re leche flan looks delicious and creamy, and I want one too (birthday or no birthday!) Thanks for joining this month! i normally only use lime in my leche flan but I will now try orange. Your flan looks so delicious. I kinda wish I had some in the fridge to eat. leche flan is our family’s special dish ….. an all-time favorite ….. your orange scent would be simply refreshing and i thought I have to try it next time ….